Every year I learn more about working with acorns, but each year I come to more and more conclusions. The latest is that there is really only one good way to make quality acorn flour: Cold leaching. Wha? Leaching, as is pulling something out. In this case, that something is tannin, which in almost all acorns is there in spades. Different acorns have different levels of tannins, but in general oaks of the red oak family have more, the white oak family less. One, the Emory oak of the Sonoran Desert, has almost none at all. Before I go much further, let me answer the question in many of your minds: Why the hell would I bother making flour from acorns? First, flavor. 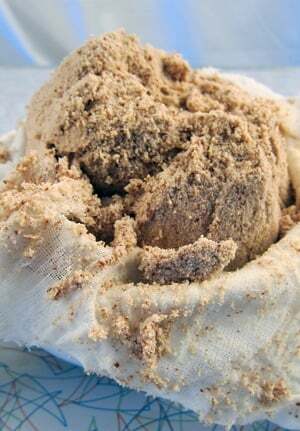 It’s a lot like chestnut flour: Nutty, a little sweet and just generally interesting. Second, nutrition. Acorns vary in nutrition. Some are very starchy, some oily, a few high in protein. Third, it’s just kinda fun to make something useful and tasty out of something many of us mistakenly believe is poisonous. 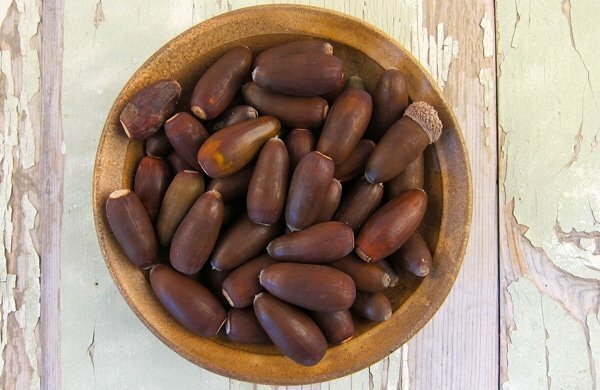 In my original post about eating acorns, I recommended the boiling water method of leaching out all those bitter tannins. This works fine, and is comparatively fast; you can have a batch of acorns leached in the time it takes to watch a football game, which is about three hours for those of you who have never actually watched a football game. The problem? The resulting acorn flour is very dark, and the boiling process destroys a key starch in the acorns — a starch that acts a lot like gluten in wheat, i.e., it helps the acorn flour stick to itself, or to thicken gravy or a roux. I have found myself using acorn flour mostly for making roux, coating meats or as a flour additive in baked goods and pasta. So that starch is pretty important to me. Cold leaching solves this problem. It preserves the starches and, when dried properly, keeps the flour lighter — closer to whole wheat than that dark chocolate brown you can get with boiling water-leached flour. The tradeoff is time. It takes at least a few days to “clean” your flour, and it can take more than a week. But it’s easy time. All you need to do is tend your flour once or twice a day. Here’s how to go about it. Start with acorns. I know, obvious, right? But know that they need not be fresh. Last summer I made a batch of flour from some red oak acorns I’d picked the previous October. I’d laid them out in a shallow layer in a large tray and just let them dry out. When it came time to crack the shells, it was so much easier than with fresh acorns; fresh acorn shells are pliable, and don’t crack like, say, a hazelnut’s shell. 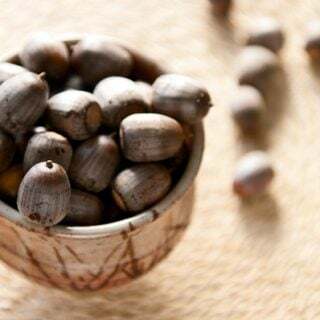 You will need to soak your shucked acorns in water overnight, though — and it’s the devil to get the papery skins off dried red oak acorns. Those skins darken the flour and are very tannic. I don’t really bother working too hard at removing the skins, but there is a trick that helps get them off (the skins are called the “test”): Freeze your acorns fresh. When they thaw and you crack them, the skin comes off a lot easier. The problem is storage. Acorns are bulky and can take up a lot of space in your freezer. But hey, if you want that skin off, it will help. Regardless, shuck your acorns into water. This helps prevent them from oxidizing. I find that if I leave acorn nutmeats out, they turn brown over time. If they are fresh acorns, the papery skins should slip right off once the acorn has soaked a bit. 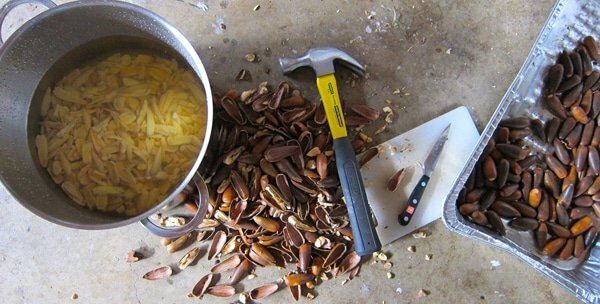 If you have some acorns with worm-eaten bits, you can cut off the bad part if you want to and toss the good part into the bucket of water. Once your acorns are all shucked, put enough of them to fill a blender or food processor (use a food processor if your blender isn’t too strong) up about 1/3 of the way. Add enough water to fill the bowl of the processor or blender up halfway. Buzz the crap out of it until you get what looks like a coffee milkshake. Play a mean trick on your friends by pouring them some, and watch the hilarity. Now, you will need a large container. The absolute perfect container to my mind are those big glass jars you get at the Asian market to make kimchi. You can buy gallon glass jars online or in many hardware stores for about $15. Pour the “coffee milk shake” into the big jar and keep adding more until you have about 50 percent ground acorns and 50 percent water. Cap the jar. 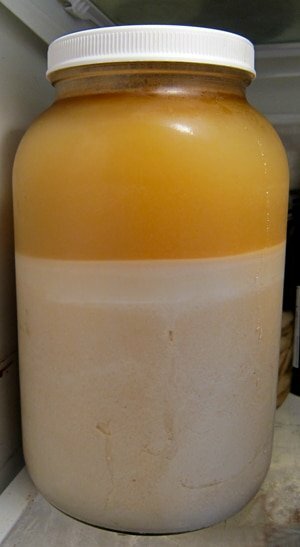 Put the jar into the fridge or just a cool place — it must be below 75°F or the flour will ferment — and walk away. Each morning, pour off the water, being careful to not lose too much of your acorn flour. Refill the jar, cap it and shake the hell out of it, turning it upside down to make sure all the acorn flour is suspended in the water. Repeat as necessary. 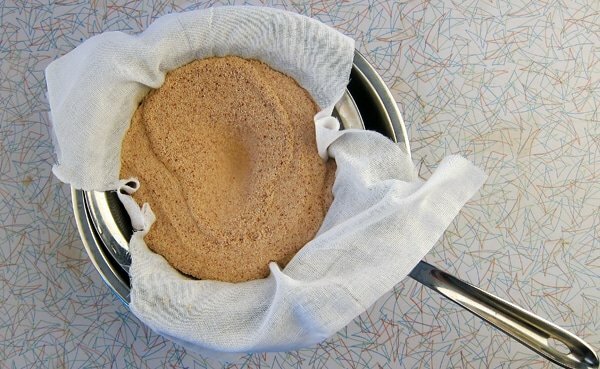 Now, there is an added tip you can do to make an even higher quality acorn flour: Strain the water every day through cheesecloth. Why? Look at the picture above: See the top layer that’s lighter in color? It’s acorn fat and starch. It’s so light some will pour off every day as you change the water. Straining through cheesecloth preserves this fat and starch and will make your flour even richer and tastier. Do this and you will be rewarded with flavor later. You know your acorn flour is ready when you roll some around in your mouth and it tastes really bland. Not tannic or bitter at all. Roasting can eliminate a little bit of tannin, but we’re not roasting in this case, so you want the flour to be as “clean” as possible. For California Valley oak acorns, Eastern white oak acorns or other “sweet” acorns, this process could take as few as three days. But 5 days is more normal. California black and blue oaks take about a week. And my Eastern red oak acorns? They took 10 days. When in doubt, go another day. You can’t hurt the flour by leaching a few extra days. Now you have a bunch of soaking wet flour. First thing you will need is cheesecloth. Any supermarket will have it, but I have taken to using real cheesecloth, i.e., cloth actually used in cheesemaking. You can buy real cheesecloth online or in specialty shops. Line a fine-mesh strainer with some cheesecloth and set it over the sink. Pour the water in the jar through it, catching all the flour. Squeeze the cloth tight around the flour to extract as much water as possible. This is why I use real cheesecloth — the cheap stuff at most supermarkets is too porous and thin to do the job very well, forcing you to squeeze less and spend more time drying — and the longer the drying time, the darker the flour. You will be left with what looks a lot like a ball of clay. Tip: Let the water in the bowl settle for 1 hour. Carefully pour off the water and you will see a layer of what looks like beige house paint or melted coffee ice cream. This is acorn starch and fat. Use a spatula to scrape it into the container you are drying your acorns in. Now you need to really dry your flour, unless you plan on making something with it right away. I almost never do this. Spread your wet flour on a baking sheet, or on a solid dehydrator tray; the trays you use for fruit leather. I prefer the dehydrator because I can dry at a lower temperature. Or, if you do this in summer, you can dry outdoors or in a hot garage. Dry at as low a temperature as you can. I use a dehydrator set at 95°F. Check in on your flour every few hours, turning it over so it dries evenly. This can take anywhere from an hour to a day. You want the flour to be dead dry. No moisture. You are almost there. You now have what is essentially acorn “corn meal,” a gritty, coarse “flour” you can use to make polenta with; it’s pretty good, actually. But to make real flour you need to grind it one more time. To turn your acorn polenta into acorn flour, grind the dried meal in a spice grinder, coffee grinder, or, best yet, a Vitamix fitted with dry blades. This is what I use, and it is worth every penny. If you have a flour sifter this is a good time to break it out. Grind and sift into a clean bowl until you have nothing but pure, powdery goodness. A typical coffee grinder will require about 35 seconds of grinding to get there, my Vitamix takes only 15 seconds. Your acorn flour is mildly fragile, especially if you are dealing with high fat acorns, like blue oaks, live oaks and red oaks. I store mine in quart Mason jars in the fridge or freezer. Stored this way, the flour will last for two years or more — which is good, because oaks don’t drop huge amounts of acorns every year. Does all this sound like a lot of work? Well, I won’t lie to you: It is. And like I said, this process makes the highest quality acorn flour possible. There are easier ways, but the quality of the flour is inferior. This will make you quite aware about how we take regular wheat flour for granted. Do this and I can guarantee you will not be tossing around acorn flour the way you would with all-purpose. It’s too precious. 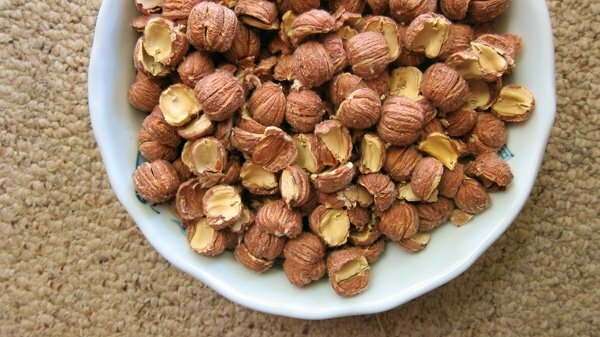 Get all kinds of tips, methods, techniques and recipes for using acorns, as well as other wild nuts and starches, here on Hunter Angler Gardener Cook! While doing the cold leaching method have you ever noticed any black spots in the jar that look a little like mold? I’m currently leaching fine ground acorns and noticed some of these spots around day 6. I’ve never had this happen with chunky/coarse ground. Chris: No, I’ve never noticed this. Not sure what it might be. Is this flour gluten free?